Shows the California gold region and Texas at its largest. 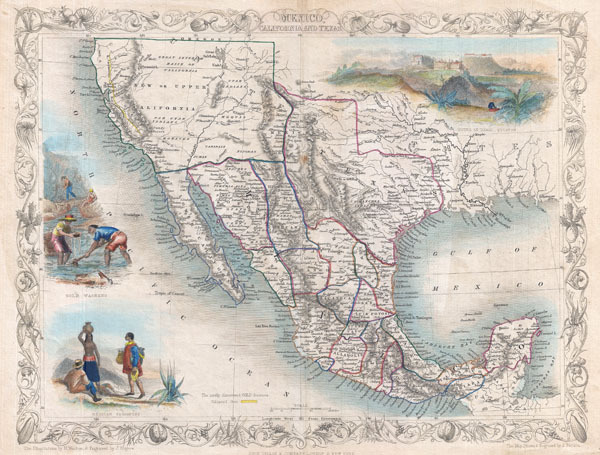 An exceptional example of John Tallis and John Rapkin's highly desirable 1851 Map of Mexico, Texas, and Upper California. Herein Texas is depicted at its fullest extent including both Santa Fe and a northern extension encompassing the Green Mountains. Drawn at the height of the California Gold Rush, this map responds to the international interest in the region by highlighting the gold fields in the Sacramento and San Joaquin valley. The 'Great Caravan Route' used by covered wagons during the westward expansion is also noted. Tallis and Rapkin erroneously combine Great Salt Lake and Utah Lake - a curious and uncommon mistake that is most likely merely and engravers blunder. Upper California is surrounded by a green border, likely meant to communicate its transfer to the United States following the Treaty of Guadeloupe-Hidalgo, though such is not specifically noted anywhere on the map. Similarly, Texas, though clearly separated from Mexico is not clearly part of the United States. These omissions suggest that Tallis was reluctant to significantly update his map plates to reflect the changing political situation in the American Southwest. Offers several beautiful vignettes drawn by H. Warren and J. Rogers depicting the Ruins at Uxmal, Yucatan, panning gold in California, and Mexican Peasantry. Undated, but the defined gold regions allows us to identify this as the 1851 issued of Tallis's valuable map. Drawn by John Rapkin for issue in the 1851 edition of John Tallis' Illustrated Altas. Tallis, J., The Illustrated Atlas, And Modern History Of The World Geographical, Political, Commercial & Statistical, 1851. Phillips (Alases) 804-71. Rumsey, 0466.072. Wheat, C., The Mapping of the Transmississippi West, 1540-1861, 737.